I don’t know what race(s) I’ll be running in this year – my brother and I had planned on participating in the Canton Marathon again (although probably not the full run), but at this point, I’m not entirely convinced there’s going to be a 2013 Canton Marathon – but I do know that I need to get back in a running rhythm again. When I’m training for a race, it’s not an issue: There’s a schedule. I follow the schedule. The miles add up. The vertical bar with the arrows is a pretty nifty tool, and corresponds to a Turtle Sport map (not pictured) – as you slide the bar along the distance, a red dot moves along the route, showing where you were at any given point. 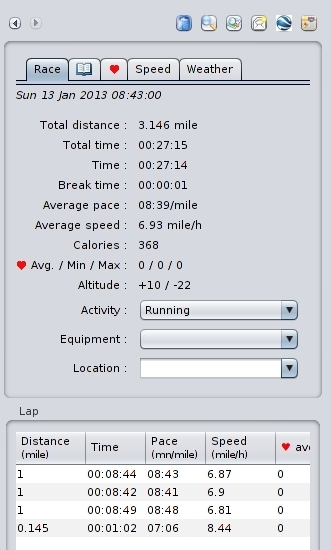 I’m not near my racing-calendar pace, but if I can keep these short runs averaging below the nine-minute mark while I get back into shape, I’m generally happy with it, and I know the times will get faster with mileage. Date, time, and distance. 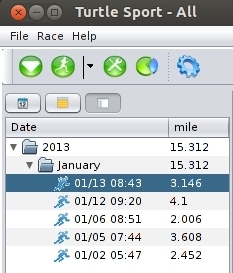 Since 7 miles a week comes out to a mile a day, and it’s only January 13, I’m ahead of the curve. For now. There’s plenty of winter ahead to mess that up.